There are also hummingbirds in Santa Fe, often feeding alongside the moths, and this makes me wonder whether the resemblance might actually be an example of mimicry, since other birds might be less inclined to try to eat a moth if they mistake it for a hummingbird. Mimicry and convergent evolution are two separate things, right? Could this be an example of both? I.e., the body shape, flight patterns, etc., give the moths all the same benefits that hummingbirds enjoy while also protecting them from predators by making them look like hummingbirds? I suspect this isn’t a case of mimicry, as the birds have keen eyes and, although hummers can eat some small insects like gnats, would probably find a moth too large to eat. The birds are, by and large, nectar-sippers. 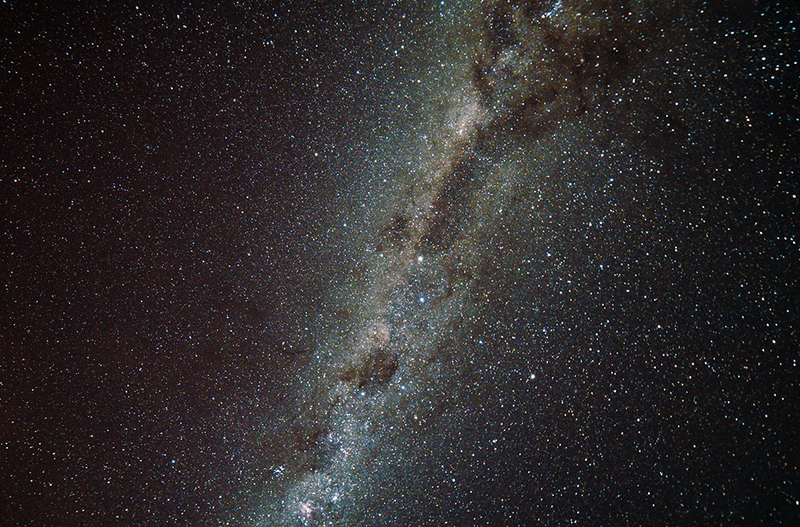 A pic of the Southern part of the Milky Way, showing the Carina Nebula at the bottom, the Southern Cross and the Coalsack, and the Pointers. Taken with a Canon 80D and a Samsung 14mm lens. This entry was written by whyevolutionistrue and posted on August 12, 2018 at 7:30 am and filed under animal behavior, astronomy, evolution, insects. Bookmark the permalink. Follow any comments here with the RSS feed for this post. Both comments and trackbacks are currently closed. That is home to one of the prime candidates for a “near future” supernova – the decidedly large and decidedly unstable Eta Carinae complex. Something upwards of 250 solar masses in several (2, maybe more) lumps, which translates to a lifetime in the sub-million year range. It has already had at least one major outburst in instrumental history, and the piles of debris surrounding it speak that it has been unstable for longer than that. I do not think it is mimicry because there are olenty of hummingbird moth species in Europe too, where there are no hummingbirds. Agrius convolvuli, for example, has the same striped pattern on the abdomen as Hyles lineata. I strongly disagree. The pattern and colors of that moth are nothing like that of the American Hummingbird moth, which features a green back and whitish throat and belly, both with nearly the exact colors of the local hummingbirds. There may be some mimicry of bees going on with this moth as well. Also there may be some confusion here with common names. In Europe, “hummingbird moth” may refer to any Sphingidae, most of which are nocturnal and don’t look at all like hummingbirds or bees except for their ability to hover. In the New World there are diurnal Sphingidae with clear wings, and these are more appropriately called the “Hummingbird Moths” or better, the “Hummingbird (or Bumblebee) Clearwing”. Are there diurnal Sphingidae in Europe? If so, what do they look like? Incidentally, the oldest fossil hummingbird has apparently been found in Europe, though there are none there today. I’ve never seen a hummingbird moth…or maybe I have and mistook it as a hummingbird. Neat insect. Beautiful Milky Way shot! Going to try something like this myself when I’m in the southern hemisphere in three weeks.